A picture of serenity: a living area set in the middle of a fish pond, with everything open to welcome in the breeze and the 360-degree view of green fields and sparkling waters. 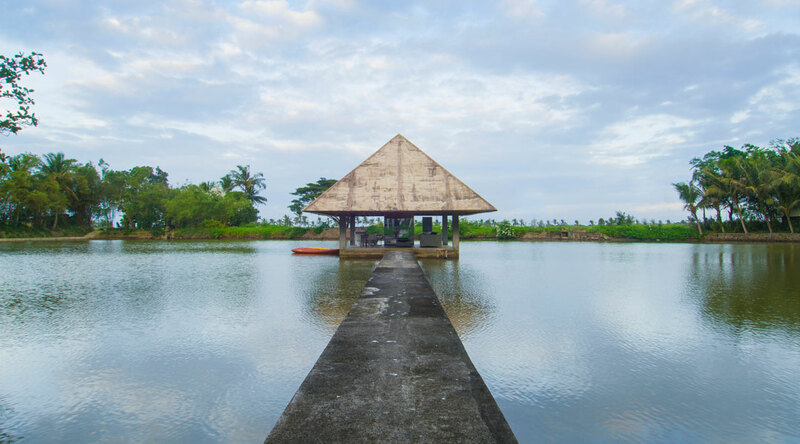 Punong, as the Ledesmas fondly call their vacation home, is Hiligaynon for “fishpond.” The 95-hectare property is comprised mostly of these, which, along with sugar, comprise the family’s chief business ventures. Its architect, Ed Ledesma, developed the compound as a place of solace for his family, away from the busy city. Daughter Bing Ledesma-Benin and family have called Punong home since 2007, after moving in to manage the business. The property used to be just a collection of fishponds, a place where fish farm workers conducted their operations, with serviceable nipa huts for when visitors arrived. The main house has an open area underneath that houses a couple of living room setups composed of the Ledesma family’s old wood and rattan furniture. One can also find a handful of sculptures by Daniel dela Cruz, Ledesma’s favorite sculptor. The Punong casitas are all installed with Indian-style double doors, which Benin says Ledesma got from the Jo Liza antique shop. The otherwise simple structures are hidden behind verdant shrubs, bamboo plants, hanging vines and water elements that evoke a tropical-paradise feel. Punong is a perpetual work in progress—a “family project,” Benin calls it. There was no master plan, the family didn’t sit down to discuss what they wanted; the place just grew organically to meet the growing family’s evolving needs. The compound’s charming casitas all used to be nipa huts, but when Ledesma’s wife said she was finding them difficult to maintain and that it would only get more so in the long run, Ledesma had the huts replaced with simple, box-type concrete structures. The casitas, built years apart over time, are uncomplicated and undemanding, submissively allowing nature to creep, crawl, sprout, grow and propagate over, under, in between and around them in wild abandon—so much so that stairs, doors and walkways all but disappear into the encroaching branches, roots and vines. There are even bathroom setups—showers, toilets, bathtubs, sinks—hidden inside mossy stone walls and tangled upon knots of tree roots. Sculptures by Bacolod artists are strewn about in the grounds, in the most unexpected places. These kinds of surprises abound in Punong—they are visual chuckles, the architect giving the observer a playful wink. When Ledesma visits his hometown Silay during his down time, he stays on the second floor of the casita where the kitchen is located. His area has its own lanai, and two enclosed sections house his bedroom and office. Benin says her father is planning to retire in Punong. For her contribution to the Punong “family project,” one of the Ledesma sisters proposed the idea of building a lap pool beside the main house, completing the resort atmosphere and providing their children a fun venue for playtime. In the middle of the compound is the main house, which looks exactly like a bahay kubo rendered in concrete: the enclosed second floor, with its large pyramidal roof, is supported not by walls, but concrete pillars, and the space underneath is used as an entertainment area. The main house and the casitas are gathered round an open courtyard with various kinds of outdoor furniture, sheltered by a canopy of rubber, narra, mahogany and acacia trees. All around the compound, glinting in the sun, are sprawling fish ponds so wide that one would think the compound is actually an island in the sea. The ponds, mirror-like and separated from each other by dykes, highlight—even double—the vastness of Punong. Bird calls persistently puncture the silence, and the place is never without a breeze. “You know, if Punong were to be advertised, its tagline would easily be: ‘You want fresh air? Go to Punong!’” Benin says. Daughter and architect Lizzie Ledesma’s casita is a five-minute walk from the main compound. Benin says the location is where Ledesma’s family used to hide during the Japanese period. Ledesma built Lizzie’s personal casita for her. The interiors are predominantly white and almost bare; only the most essential pieces, such as a sofa bed and bathroom fixtures, can be found inside the rooms. The entire place was (and is still being) developed wholly by instinct; the placement of the casitas, their respective orientations, the simple look of the living quarters—overall, the confluence of Ledesma’s built environment and the lush, serene setting—is an interesting study in architectural intuition. Luxury getaways and resorts, featuring a mishmash of architectural styles that try too hard to compete for one’s admiration and attention, are a dime a dozen, but only a handful can match the organic and effortless feel of Punong, which was never built to satisfy marketing strategies or tourist numbers, but to help shelter and rejuvenate the family that calls it home. Curiously, punong also means to enclose and confine, and can be a synonym for “quiet,” “calm,” “tranquil.” There is a veritable hush upon entering its grounds, and lingers even after one has left; indeed, it is punong. This story was originally published in BluPrint, Volume 2, 2014. Edits were made for Bluprint.ph.